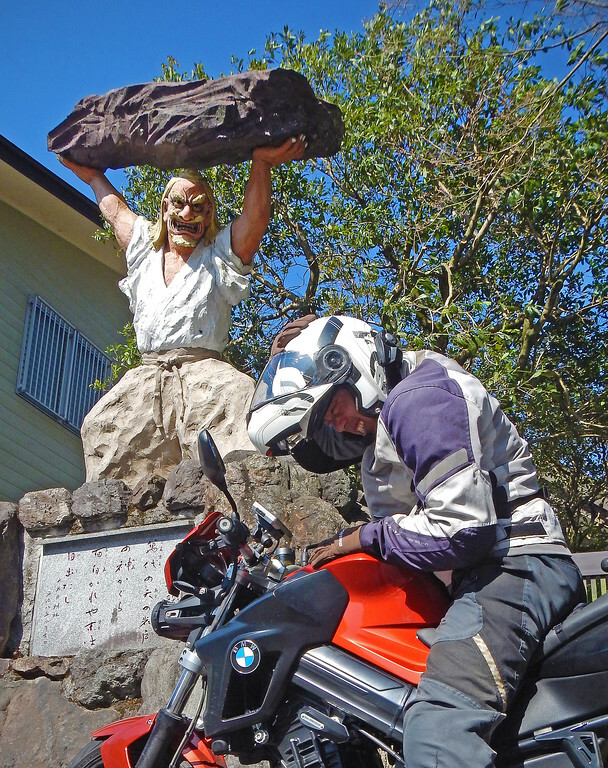 We continue our ride southwards through the Miyazaki Prefecture, on the island of Kyushu. We love the mountains in Miyazaki! So scenic! 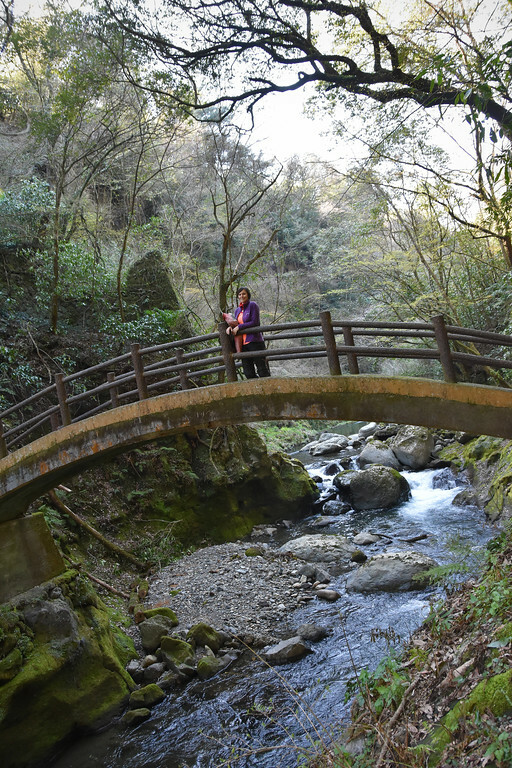 12% of the land in this prefecture is devoted to National Parks! 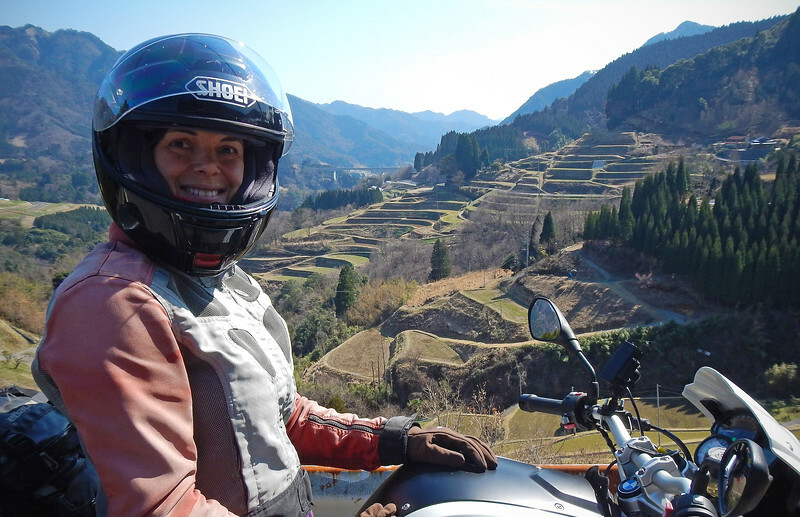 Tokubetsuto Senmaida (rice terraces) in the background. Not as grand as the Maruyama Senmaida we saw a few days ago, but still very pretty! The senmaida sit empty waiting for planting season, which will probably begin about 4-6 weeks from now. 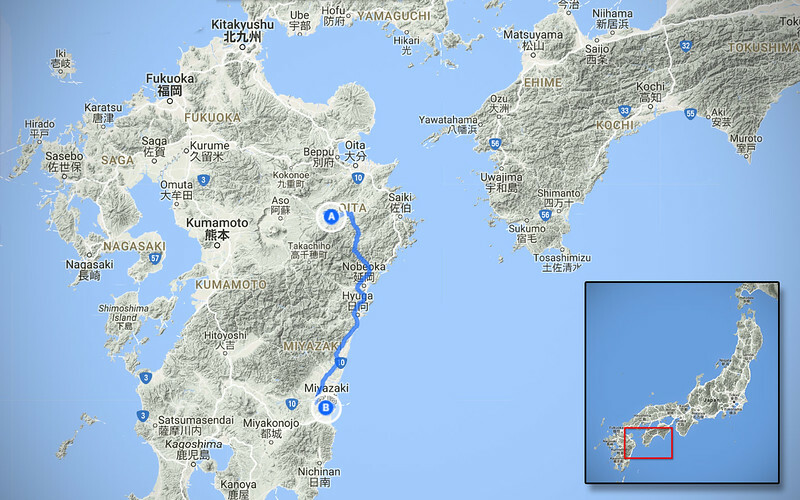 From here, we head towards the town of Takachiho, in the northern section of the Miyazaki Prefecture. Drama in the parking lot of the the Ama-no-Iwato shrine. 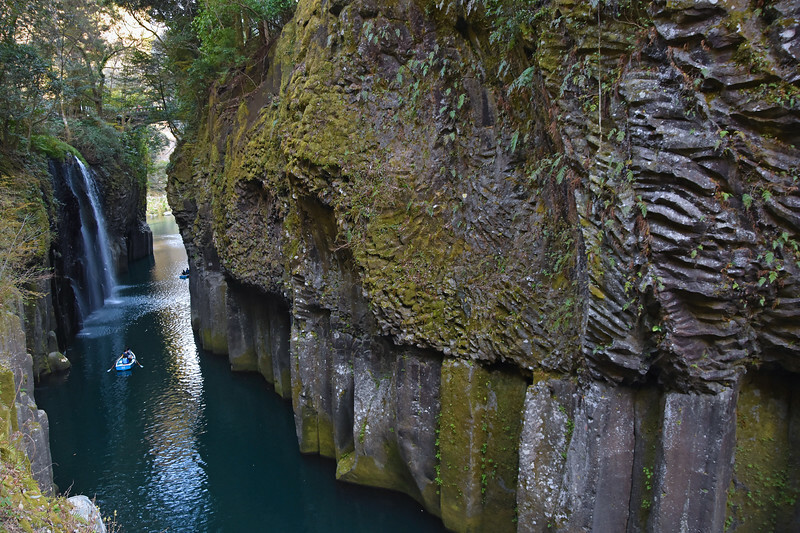 There's a lot of mythology set in Takachiho. Although this angry dude looks like he's going to drop a rock on my head, he's actually one of the good guys. Legend has it that the Goddess of the Sun, Ameterasu-omikami, was once driven into a cave because her brother, the God of Storms, was bullying her. Such a timeless tale! Anyway, her retreat into the cave deprived the land of light, which co-incidentally explained why there was a total eclipse of the sun at the time. A bunch of other gods threw a party outside the cave to draw her out, and finally, the God of Strength and Power, Ame-no-tajikarao, lifted the rock blocking the cave entrance and the Goddess of the Sun came out again to grace the land with her light! What did he do with that rock? He dropped it on a random motorcyclists' head! 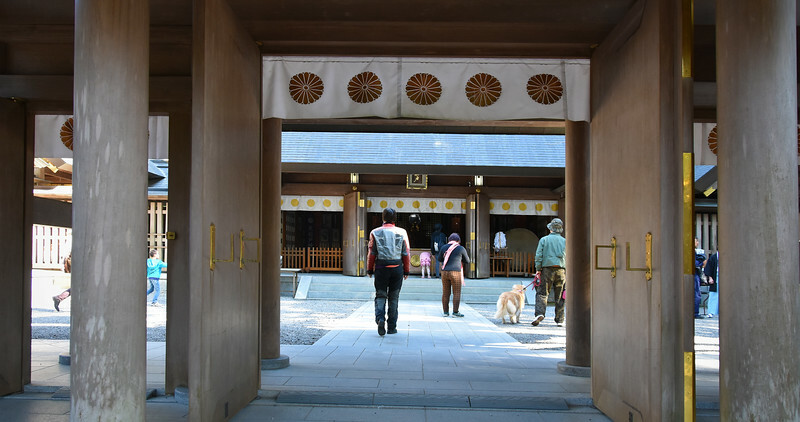 Higashihongu Shrine near the entrance. There was a guy dressed in traditional robes talking to everyone. Not sure if he was a priest or a guide... I'm so ignorant! Pale half-moon sits above the temple roof, paper cards with wishes written on them hang from a board outside the srhine. 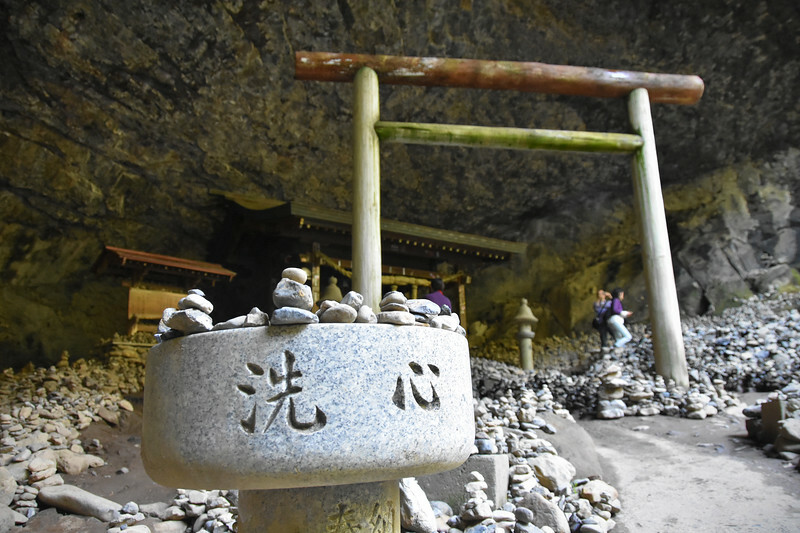 The path ends at Ama-no-Iwato, which means "Cave of the Sun Goddess". Hey, you mean the story is real?!? 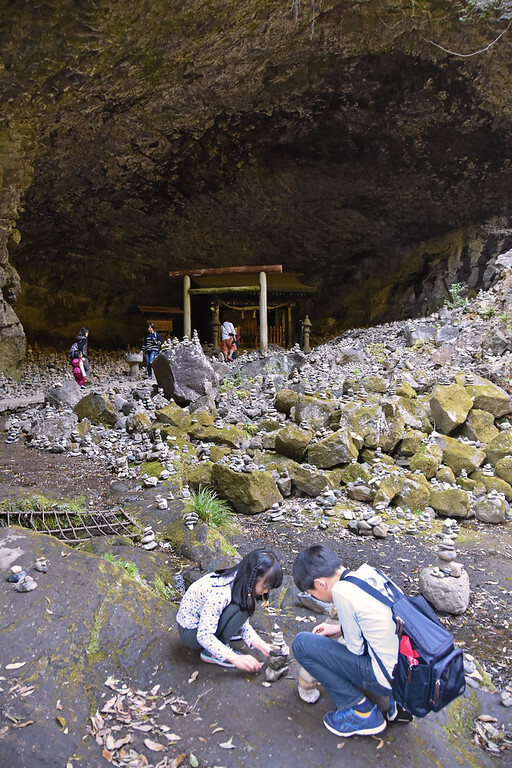 The path leading to the cave and the cave floor itself is littered with rocks of varying sizes and visitors have built little inukshuks (I only know the Inuit word for stone people, not sure what the Japanese word is) all over the place. This is the real temple of the Sun Goddess! We hike back to our bikes. It's going to be a very short ride to our next destination. 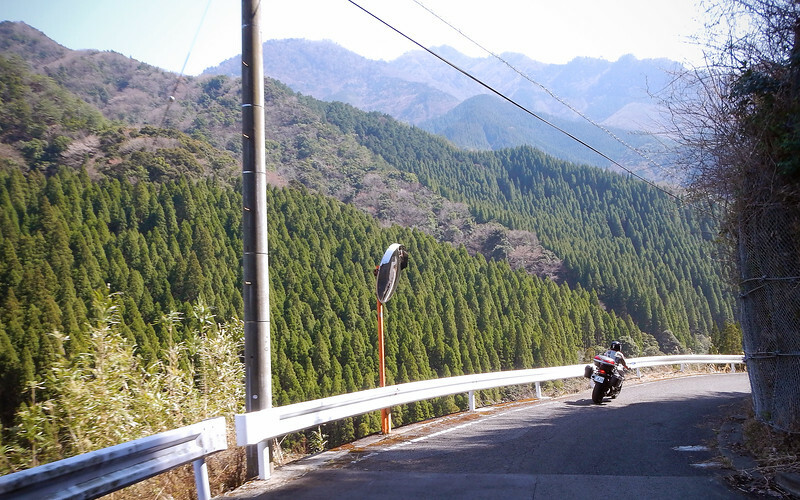 Zooming through the heavily forested mountains roads in the Miyazaki Prefecture. So awesome! We really appreciate these mirrors posted up at each corner in the tight and twisty mountain roads, we make use of them all the time to see if there's any oncoming traffic. 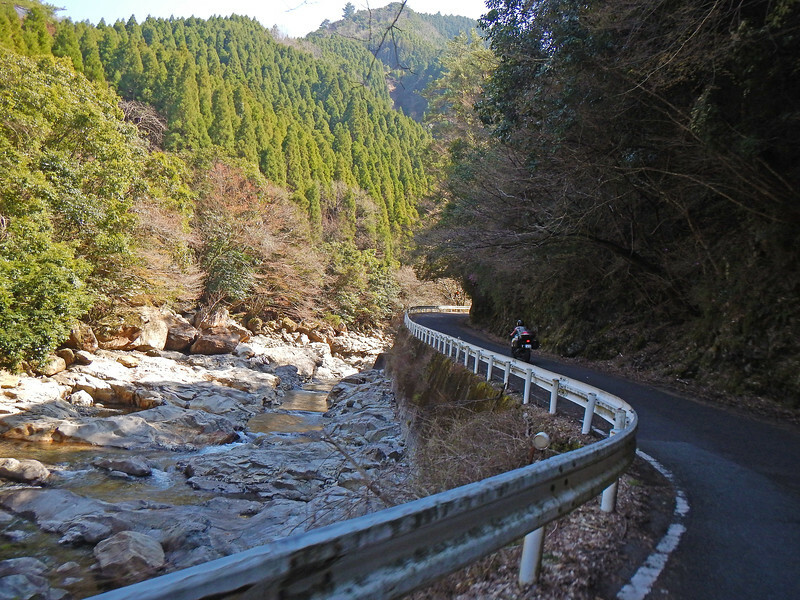 Less than 15 minutes ride and we arrive at Takachiho Gorge. 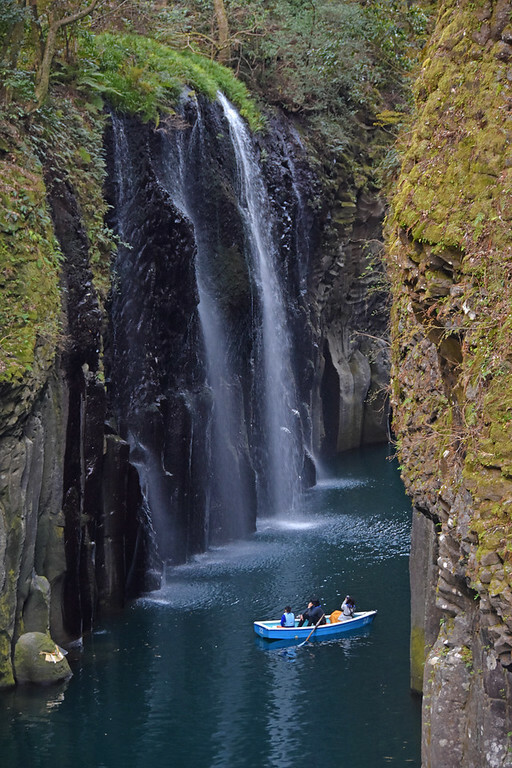 Takachiho Gorge is one of the most popular tourist destinations in the Miyazaki Prefecture. However, we're arriving so late in the afternoon that all the tour buses have already left. We park on the sidewalk next to a scooter and the parking lot attendant walks right by us and ignores our bikes. *shrug* Cool. Free parking once again! 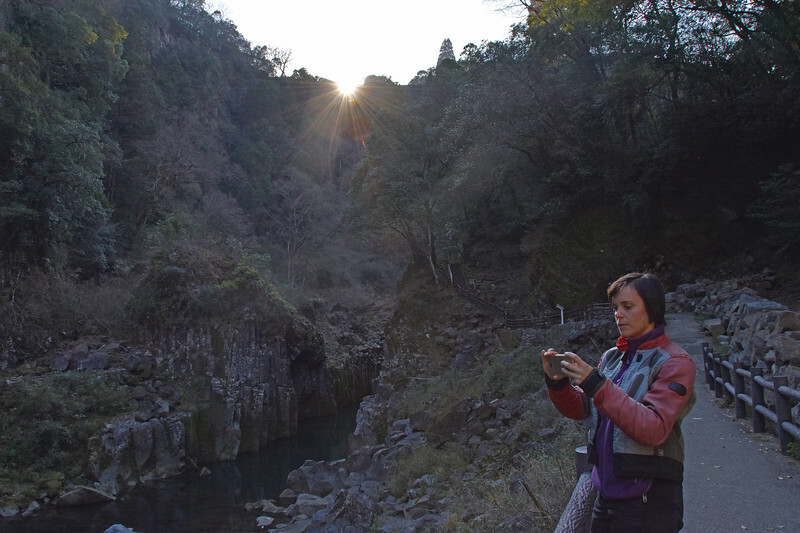 Clear blue sky refected off a pond at Takachiho Gorge. Neda says the duck looks like a painted wooden statue! It was real. 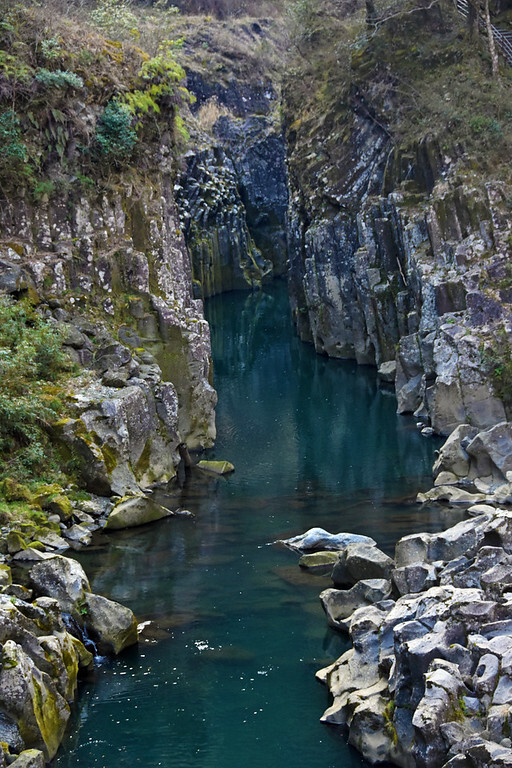 The Gorge was carved out during the same lava flow that created Harajiri Falls that we visited earlier on, about 90,000 years ago when Mount Aso erupted. that flow into the gorge. Very pretty! Our daylight hours are short enough as it is! The mountains are no help at all when the sun disappears below them at 4:30PM! We are one of the last people to leave the Gorge as we climb back onto our bikes. There's about 140 kms we still need to cover if we want to make it to the next populated centre further south. So ironic that in the Land of the Rising Sun, it always feels like we are racing against the setting sun every evening. Although the days have been getting noticeably longer since we arrived in Japan, this was quite a long riding day and we pulled into the city of Miyazaki well after sunset. We haven't booked any hotel or AirBnB yet, plus we are starving (! ), having eaten nothing since a late breakfast. Just as we cross into the city limits, we see a large lit sign by the side of the road with pictures of well-marbled red meat! Yes! We are totally in the mood for meat! Also, we can sit down in a warm restaurant and try to find a place to sleep tonight. Taking our shoes/boots off is a regular ritual before entering any building in Japan. Once we're in, we treat ourselves to a meat fest! Yakiniku is Japanese BBQ. It's heavily borrowed from the Korean BBQ restaraunts where they bring you plates of raw meat and you cook it yourself over a personal grill set in the middle of the table. It's not really traditional as Yakiniku only came to Japan after WWII, but it's very popular here, especially in Miyazaki because they are known for their Wagyu beef in this prefecture. During dinner, we got on the Internet and found a budget business hotel situated right in the centre of the city. So off we go! But as soon as we depart the restaurant, it's freezing once again because the sun has disappeared. Thankfully, it's a short ride into town at city speeds and traffic is sparse because it is so late at night. 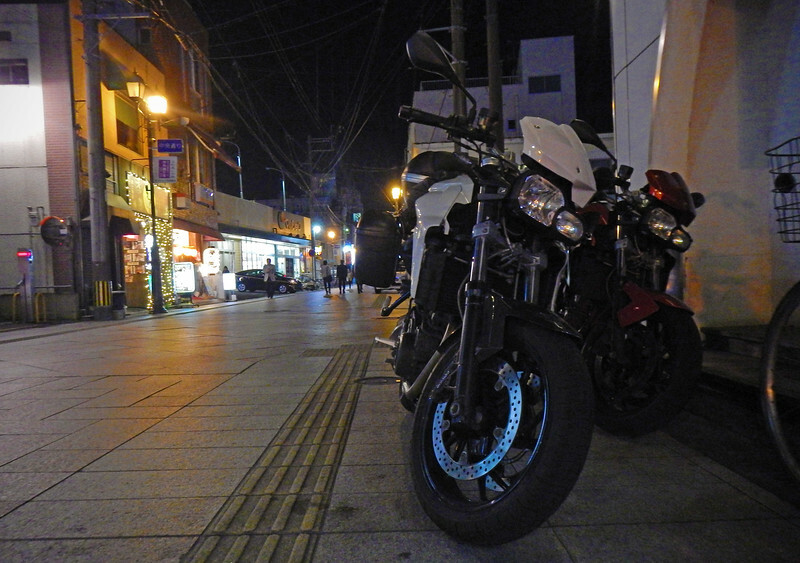 We circle around the deserted streets of Miyazaki in the dark, searching for the hotel. This doesn't concern us too much. Japan is probably the safest country we've ever visited. Really enjoying our travels through the Land of the Rising Sun!